WHAT IS “THE 4 STEP POKER” VIDEO COURSE? When you are ready to commit to make poker a priority, many are the aspects to adjust in order to successfully complete the switch! Bankroll management, laser like focus, tilt control, stamina, game selection, crafting your ideal image, discovering what game works best for you. These are all skills you need to sharpen in order to succeed. And together we’ll create a custom plan based on your goals and desires to get what you want out of poker. 20+ Video Modules of densely packed content which disclose how I beat the industry of poker for 10+ years, growing my bankroll and living a life of absolute freedom. 2 Bonus Videos which show you an in depth look at the variance in poker so you can learn the tools to manage your money and never go broke as well as my never before seen in depth analysis from 5 game changing hands I played in Macau. 20+ Actionable PDFs Worksheets designed to get you to take initiative immediately and customize the entire experience to your personal situation. Over 15 hours of exclusive video content containing the secrets and resources I’ve used to travel the world and beat the professional circuit for over a decade. A Community of aspiring professionals and committed players just like yourself, to whom you can access through the video course forum and share stories, ask for feedback and help each other grow. NOTE: This is the overview of the entire Four Step Poker course. Right only Step 4 is currently being finished, but you can still pre-order and save a ton. GET THE ACCESS TO ALL 4 STEPS NOW AND SAVE $700!!! GetThe Access To The First Three Steps Instantly And Be First To Receive Step 4 When It Becomes Available! Find the A's to your Q's in this comprehensive FAQ guide! Once you purchase 4 Step Poker you will get immediate access to the course via the online platform Kajabi Next. You’ll receive your unique username and password that will allow you to access the course (video modules available for download) and its worksheets (in a PDF format) as well as engaging with the community of users that already joined the course. Each video module comes with a PDF follow up exercise designed to make you dig deep and implement the strategies you’ve learnt thus far. DO I HAVE TO QUIT MY JOB TO TAKE THIS COURSE SERIOUSLY? No. 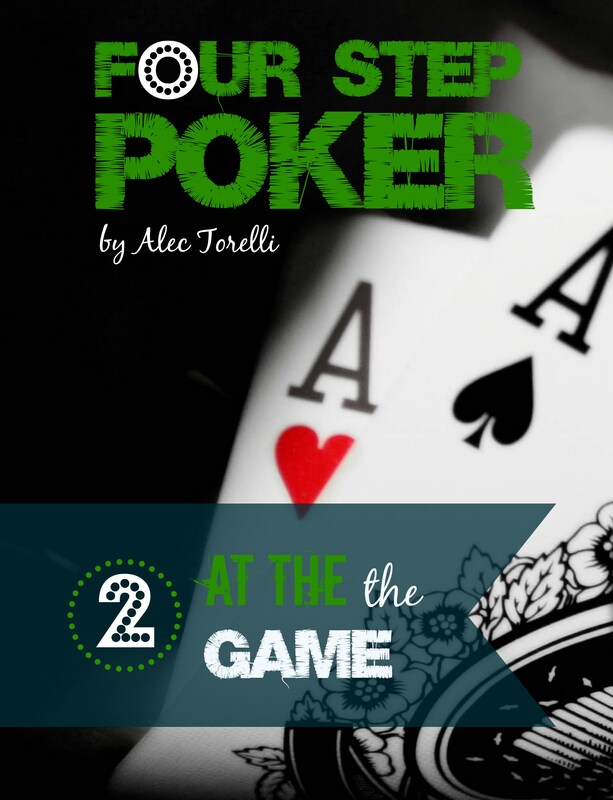 4 Step Poker is a course for anyone who wants to get serious about playing poker. Many people have taken the program and maintained the current jobs or simply played poker part time, as a passion and way to earn extra income on the side. Graduates come from all walks of life, from the 22-year-old aspiring player, fresh out of college with his entire future ahead of him, to the 45 year old father of 2 who just wants to supplement his income and build a badass lifestyle for him and his family. CAN I BUY ONLY A PORTION OF THE PROGRAM BECAUSE I JUST NEED HELP WITH SPECIFIC TOPICS IN ONE THE COURSES? You can buy Step 1 alone for a cost of $497 and, once completed decide if you wish to continue with the rest of the program. However you must work through the program in order. WILL I BE ABLE TO JOIN A COMMUNITY OF LIKE MINDED PEOPLE AS I READ THROUGH THE WORKBOOK? Yes. When you purchase the video course, you get access to a platform called Kajabi Next where lots of aspiring poker pros like you, who are studying the material of the book, can share their progress. In the forum you can post questions, share your struggles as well as your success and learn from the experience of others. WILL I RECEIVE A DISCOUNT IF I BUY ALL FOUR STEPS? Yes. Step 1 alone costs $497, however since the course is still on pre release, and to encourage students to finish the program we are offering a massive discount for those ready to take action now. If you buy 3 Steps you get the last Step absolutely free. $1497 for the entire course instead of $1988, a savings of 25%. WHEN WILL STEP 3 AND 4 BE RELEASED? Step 3 will be out on September 15th 2016. Step 4 will be delivered on November 15th, 2016. The program is timed this way to make sure that each subsequent step is released as users in the previous steps graduate through the program. If you’re serious about getting serious then take advantage of the pre release special. For $1,497 you’ll get access to all 4 Steps when they become available. Most students take one month per step anyway so you really won’t be affected by the release date of the future steps. DO I GET ACCESS TO THE ENTIRE 4 STEP PROGRAM ALL AT ONCE? The Four Step Poker curriculum is carefully designed to keep you on track and on pace. It’s important that you do the program in order and follow the pace of the program. In testing this method on countless students and clients, I’ve learned that some modules take longer to implement than others and that time needs to be allowed in between each module for you to apply the information you just learned. If you like to rush into things and want to jump ahead or get everything at once because you feel like you’ve heard or seen this all before then this may not the right program for you. Once you complete the program you’ll have lifetime access to all the information and can revisit anything in any order at any time. No, however you can purchase Step 1 individually for $497. If you wish to continue afterwards we will still honor the discounted price and charge you an additional $1,000 for the remaining 3 steps. Simply use the discount code you receive in your email after you’ve made your purchase and you’ll have access to the lower price. We offer this because we firmly believe that once you’ve tried Step 1 you’ll want to continue in the program and complete the remaining steps. WHAT LEVEL/STAKES OF PLAYERS THAT CAN TAKE THE COURSE? Take the Four Step Poker course if you’re an aspiring or new professional, or want to get more serious about making money on the side. It doesn’t matter what age or level you are, what’s important is your commitment to becoming more serious about making money playing poker and treating the game like a business. Players should have a background playing poker and be in a reasonable life situation to either play poker on a weekly basis or be ready to attempt being a full time professional. HOW LONG WILL THE 4 STEP POKER COURSE LAST? The Four Step Poker course is built over Four Steps containing 5-7 video modules each. Each Module comes with it’s own actionable PDF worksheet which helps you implement what you just learned directly into your poker game. DOES THE COURSE START WITH A FOUNDATION AND BUILD UPON ITSELF? The information in the course is progressive and builds upon itself, which is why students’ users are required to start at Step 1. Once you complete a step you are free to continue onwards to the next one as soon as the product becomes released on the market. CAN I BUY JUST ONE INDIVIDUAL STEP? Yes. We never want our clients to feel pressured into a commitment they aren’t ready for. We also firmly believe in the value we are offering and that if you try one of our products, you’ll experience the value for yourself and we’re certain you’ll continue the program. Students are fully welcome to pay for each step as they go, however since we want to reward commitment we’re offering huge savings if you buy all 4 Steps at once. Note: You MUST buy the steps in order. The course is carefully designed to build upon itself and help you progress along your poker journey. You must start with Step 1, and continue in order. HOW LONG IS EACH VIDEO TRAINING PROGRAM? The videos vary between 20-60 minutes in length. More than the specific time per video they are very dense, fast paced and have a ton of content. Each video also comes complete with a PDF worksheet to help you put things into practice. Remember the way you’re going to get value from this course is by doing. If you’re concerned about the specific timing of each video being a measure of the courses value then this program is not right for you.